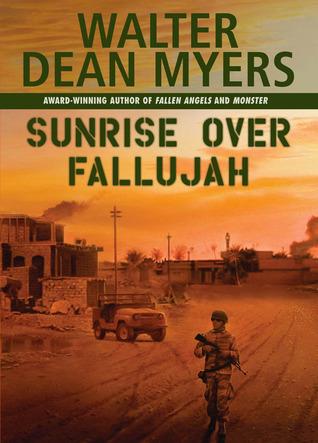 Today is week 1 of our group read-a-long of Sunrise Over Fallujah by Walter Dean Myers. This week we read pages 1-86, and we hope you’ll leave your comments and/or answers to the questions after the post. 1. What are your first impressions of Robin “Birdy” Perry? S: So far, I like Birdy. He’s amped up, but not overly so. He’s aware that war changes people, like his uncle, but he’s also aware that he was to contribute to society. While he’s a little unsure of his place in the army and feeling unprepared for the realities of war, he’s adjusting on the fly and trying to make the most of it. It’s clear he’s gone through the training, but I don’t think he feels prepared enough. 2. Civilian Affairs Battalion is expected to help the Iraqi people rebuild democracy. What do you think about that mission — realistic, too idealistic, or a combination? S: I love the idea of being able to help a people rebuild after the elimination of a dictatorship, but when you’re also doing the ousting, it’s a little difficult to separate the two missions, especially when the people rarely, if ever, speak English or even have common goals. I think at best its an ideal, but at worst its a delusion that will quickly unravel. 3. How realistic do you find the characters initial interactions with each other and their reactions to what goes on around them? S: I’m enjoying the enigmatic Jonesy for his blues and his connection to religion, while I’m also very engaged by the tough girl, Marla Kennedy. It seems like Jonesy’s trying to be aloof and tough, not trying to get too attached, but he’s taken sort of an instant liking to Birdy. Meanwhile, Birdy cannot seem to make out Marla or Jonesy’s motives or personalities yet, which is probably the nature of war and how it makes people want to remain as removed from others as possible to avoid the unavoidable loss they will feel if someone dies. So far, the interactions between the characters are believable given the situation and what’s expected of them. I really enjoy how Myers pinpoints reactions with body language as well as dialogue, like when Jonesy’s hand is twitching and Birdy’s just staring at the dead boy. 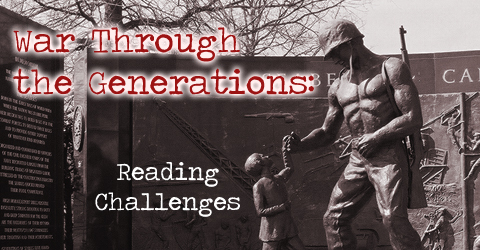 If you have discussion questions for the first section, we’d love to hear them. Post here or on your own blog. We’d love to read your thoughts…. 1. My first impression is he is a bit of a wimp. Typical Army volunteer who has no concept of what war might entail. I suppose he might be representative of a lot of American soldiers who participated in the war. 2. I agree with the word delusional. No offense to the downtrodden people of Iraq, but you have to have a foundation to build democracy on. You can’t just hand it out like Hershey’s bars. Also, people just don’t like conquerors whether they are benign or not. And after all, bringing democracy to Iraq was just an excuse for the deposing of Hussein. 3. I think the interaction seems realistic although stereotyped. Jonesy is the street hipster, Birdy is the sensitive intellectual, and Marla is the tough girl trying to outman the men. Kevin, thanks for joining us in the read-a-long. I agree with your observations in question 2. I do think that Birdy is very much like the typical soldier that goes to war…completely unaware of what war is and how it will be, but I wonder if that will ever change no matter what generation or what war it is. Yes, the characters are a bit stereotyped, but I wonder if that has to do with the audience for this book — young readers — and an author’s attempt to give them references they can identify with, though maybe not. I wonder if it would be a good idea to give us the questions before the section so we can be looking for our answers. Your comment about it being a young adult novel is well taken. Kevin, right now, Anna and I are reading the book at the pace set forth in the schedule, which is why the questions are posted on Friday for discussion. But please do feel free to post your own questions or comments about the book each week in the comment section. Here I am…finally! Sorry I’m so far behind. 1. I’m not sure what I think about Birdy so far. He seems pretty weak to me, though I like that he’s not afraid to admit to himself that he is downright terrified. I’m sure I would be, going into a war zone, but then again, I know that I’m definitely not cut out for military service. But this leads to the question I have for this week: What do you think about Myers’ choice to use the 1st person POV? At this point, I’m not really liking the book, and I think it’s because I think Birdy is a weak character and a weak narrator. I know that part of the point is that the soldiers themselves didn’t always know what was going on strategy-wise, and they often are unprepared for the reality of combat. But I wonder if a 3rd person narrator would have been a better choice to provide more information, not only about the war itself but also some backstory about Birdy and his relationship with his father. (Serena, would it have helped if I read Fallen Angels? That’s the one about his uncle in Vietnam, right?) I’d like to know why he enlisted because, to me, he doesn’t seem like the Army type. I would’ve liked to get to know him before he got shipped out. 2. I’m definitely not an expert on Iraq or this war or discussions of this type in general, but I’m not sure how effective it is to push democracy on any country that isn’t democratic. 3. I agree with Kevin that the characters are realistic but stereotyped, especially Marla. And I agree with Serena that the image of Jonesy’s hand twitching was a good one. At this point, I’m having a bit of trouble keeping track of everyone, but that should change the more I get to know them and the further I get in the book. I think this would be a better story as an adult novel. The writing style is a bit too simplistic for me right now, with the short sentences, but maybe that’s because Birdy is the narrator. What I do like is how Myers shows the confusion about what’s going on, how the soldiers can’t tell which Iraqis are friendly and which are the enemy. I don’t mind the first person POV, but that’s because I prefer to hear things from a soldier that is terrified rather than the macho type, like Harris, who seems to be all bravado! I’m not sure that reading Fallen Angels first would have helped at all, honestly. These are separate enough stories, but I hope that we do see more about Birdy’s relationship with his father….and why he enlisted.